There was a lot of “expert” speculation the Bulls were a .500 team without Derrick Rose. They are now at 5-5 after a 102-94 loss to the Portland Trail Blazers Sunday. Though the way the Bulls are playing, a fourth consecutive game giving up more than 100 points for the first time under coach Tom Thibodeau, a rare back to back loss — and not exactly to the defending champions — allowing 49 percent shooting for the second straight game and with a reserve rotation that obviously has Thibodeau thinking of changes, well, playing .500 ball could be a goal before too long. “The defense right now, the intensity, we’ve got to get that part right,” said Thibodeau. “The rebounding is not good, the defense, rebounding and turnovers, all three are a problem now. We’ve got to correct that. Those three things put you in position to win. Then inside/out, sharing the ball. I loved that last part because it reminded me of one of those motivational sayings you see in a football locker room. Thibodeau is a great admirer of NFL Patriots coach Bill Belichick, and Thibodeau often sounds like a football coach with his preaching of defense. But you also get the sense watching this Bulls team thus far that Thibodeau wishes he could send out different units, offensive and defensive, because the Bulls can’t seem to find the right groups to mesh with the personnel turnover since last season. So after the Bulls fell behind 67-53 midway through the third quarter, Thibodeau went with a defensive heavy group with Joakim Noah, Taj Gibson, Deng, Kirk Hinrich and Jimmy Butler. “I thought the group that got us going was when Jimmy and Taj came in,” said Thibodeau. “We started playing some defense. We gave ourselves a chance. But we dug such a big hole in the second quarter again it was too much to get out of. The one group that played some pretty good defense was Kirk, Jimmy, Lu, Taj and Jo. We’ve got to get that part down. You’re not going to win on the road with the approach we have now. So the Bulls did get back into the game. But perhaps the issue that hangs most desperately and obviously over this Bulls team is what you do after you stop them. Thibodeau always has talked in theory like a basketball shutout was possible. He and we know it isn’t. So there the Bulls were late in the fourth quarter, again trying to climb back after tying the score at 73 with 10:50 left but then trailing by nine with about two minutes left. The offense manned by mostly defenders slowed with Noah stuck with the ball. Noah was excellent with a big bounce back game of 16 points, 15 rebounds and eight assists. He looked right and left with little movement, and then rolled to his left putting up a wild running hook that missed. Nicholas Batum rebounded and got the ball to Wesley Matthews for basically a clinching three to make it 93-81 with about a minute and a half left. Yes, Noah has been very good this season on offense, averaging 14.8 points, second to Deng, along with 10 rebounds and four assists, certainly All-Star numbers. But your big shot closer? Nate Robinson, who led the Bulls with 18 points, 13 in the fourth and all in the last four minutes, gave the home fans a little scare with a late barrage and a couple of tough threes to get the Bulls within 98-94 with 13.9 seconds left. But the Trail Blazers made their free throws to close it. There was a bit of a dispute at the close when hot rookie Damian Lillard dunked the ball with two seconds left and the Bulls walking off, violating one of those unwritten rules of not scoring if the other teams doesn’t think you should score. Lillard was handled reasonably well by both Hinrich and Robinson, though he scored 16 points and became the first rookie since Isiah Thomas to average at least 19 points and six assists in his first 10 career games. Lillard did apologize, saying he didn’t know, though Noah had a similar incident last week. Someone find that unwritten rule book! However the Bulls take it, it’s not enjoyable. The Bulls are beginning to take them with frequency and there seem more problems than obvious solutions. Thibodeau, who thinks defense first, went with his defensive group and the Bulls finally responded. 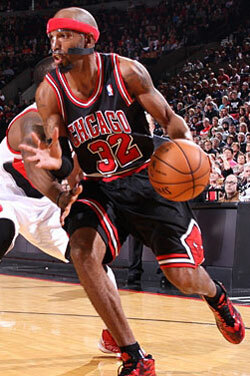 But he left out Richard Hamilton, who had been having a good game with seven of 10 shooting and 15 points. Also, Carlos Boozer, after back to back 20/10 type games, didn’t play the fourth quarter and finished with four points and three rebounds on two of eight shooting. When you have defensive players in they defend. But they also have difficulty at times seeing offense and knowing how to develop it. “Guys still are learning each other,” said Hamilton. “At times it’s good, at times it’s bad. But we’ve got to get together playing at a high level and understanding how we are going to be great. It’s not easy. When I came last year there was no training camp. I felt I knew everything about basketball having so many coaches. But it’s different calls and sets, trying to understand teammates and things on the fly. It’s not so easy. Like recognizing matchup advantages, going to the right player for scoring. But at the same time if defense and pressure is your priority and you are promoting those kinds of players, they are more likely not to think offensively or recognize matchup advantages, which Hamilton seemed often to have Sunday and were missed. Though perhaps the biggest issue, and the one where Thibodeau suggested some change is in order, is what to do about his first major substitution, which usually is to start the second quarter with four reserves and Deng. Thibodeau acknowledged how badly the Bulls have been falling behind at that point in the game, like Sunday after leading 30-23 in the first quarter but being tied before midway through the second. Thibodeau could substitute earlier in the first, though he’s wanted to get leads early. He may come off using Nazr Mohanmmed and Marco Belinelli, who have struggled with Belinelli zero for three in 19 minutes against Portland. Gibson did show some more life with 11 points in 22 minutes and five trips to the free throw line as he got away from shooting the longer jump shots he’s been attempting this season. And Robinson did come on late with a surge of shots, which is his tendency to play in streaks. With that early second quarter group, which generally doesn’t feature much defense, it hasn’t been a good mixture. Thibodeau figures to change that mix, though that produces sort of a Catch-22 as well, one he’s been dealing with in trying to adjust to this roster. By tinkering with different rotations and players in changing situations, it’s difficult for the players to grow comfortable with one another. Yet Thibodeau apparently feels he has to search to find who will play well with one another. As we knew, it wasn’t going to be easy this season. After the one sided loss to the Clippers Saturday, the Bulls moved on to a mostly young Portland team which isn’t considered a playoff candidate. They have talent in LaMarcus Aldridge, who had 18 points and 13 rebounds, and Batum, who matched Matthews with 21 points. But they are working in their rookie point guard and an uncertain bench. So for the Bulls even with losing eight of the last 10 in Portland, it seemed an opportunity. Also because Portland plays a small center in J.J. Hickson and Aldridge prefers jump shots. It seemed clear the Clippers athletic, shot blocking front line bothered the Bulls. But they were more aggressive, especially trapping Lillard late in the first quarter and had six players with at least four points each in taking that 30-23 first quarter lead with 61.9 percent shooting and 18-8 in points in the paint. Noah was taking his jump shot without hesitating and making it, Boozer had a pair of nice inside scores and Hinrich got himself going with a pair of layups. The rim was easier to get to and the Bulls had an overall 54-38 edge inside. You should win with that. Thibodeau has been supportive of Hinrich because his defense has remained good, and even Chris Paul scored just one basket against him. But after Rose, the Bulls offense is designed for the point guard. And Hinrich has also had to adjust to that. But turnovers again have been an issue with the Bulls committing 19 for 26 Portland points, contributing to the defensive issues. Obviously, turnovers lead to fast breaks and easy points. But with the unfamiliarity, there have been many shots taken that surprise teammates. They also lead to runouts and easy baskets. And uncharacteristically, this group of Bulls players hasn’t been as good at hustling back than in prior seasons. 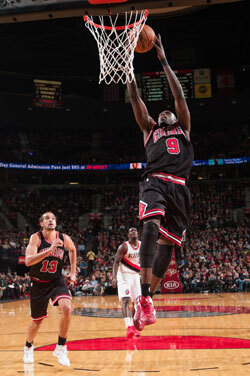 Though the problems again began with that second unit of Deng, Mohammed, Gibson, Belinelli and Robinson. The Bulls scored two points in the first six minutes of the second quarter as Portland took a 34-32 lead. It was turnover or quick shot and Portland runout, and even with more mixing and matching the Bulls trailed 51-43 at halftime. The Bulls scored 13 second quarter points, a Portland defensive best for the season. But the starters weren’t much better after halftime as the Trail Blazers opened on a 13-6 run with ball movement baffling the Bulls and Batum and Lillard getting threes. Thibodeau felt the Bulls regained their equilibrium after substituting Butler and Gibson for Boozer and Hamilton nine minutes into the third and trailing 69-60. But after moving into a tie at 73 early in the fourth, Noah, playing another 41 minutes, made a bad pass out of bounds, Deng missed a pair of shots and Hinrich committed a turnover and fouled Ronnie Price running for a layup. Though at least he tried to get back. “We’ve tried a lot of different combinations, so we’ll see,” said Thibodeau as the Bulls prepared to move onto Houston and a reunion game against Omer Asik Wednesday. Thibodeau put Robinson back for Hinrich and Belinelli for Deng, giving Deng and Noah brief fourth quarter rests. But Gibson and Robinson committed turnovers, Belinelli missed a 20 footer and Noah another. And when Matthews hit a pullup with five minutes left to lead 87-75, there just wasn’t enough time or offense even with Robinson’s burst to avoid another defeat. The Bulls even with Robinson making those two late, desperation threes were four of 16 on threes, shooting them at a poor 30.6 percent for the season and ranking in the bottom of the league in attempts and makes. Without the go to scorer of Rose’s ability and no true isolation players, the Bulls also have to make threes. Which they haven’t enough. They really do work hard most of the time, driven by Thibodeau’s effective coaching and an appealing personal pride. But most everything has to go well very often. They knew there would be a negligible margin for error. It’s showed itself the last few games.